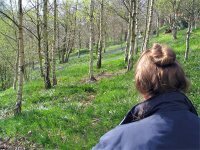 Yesterday we made our annual trip to visit the bluebell slopes at Emmetts Gardens in Kent. They weren't as far advanced as I had hoped - but they were on their way. 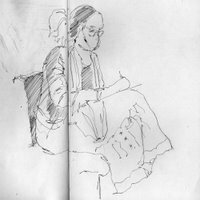 "He who must not get bored while I sketch" brought his book (Roy Hattersley's "The Edwardians") and even took some photos of me sketching! Posted by Making A Mark on Sunday, April 30, 2006 1 comments Who's linking to this post? A new BBC three part series about the Impressionists starts tonight - which in turn has generated a new 'Impressionist's Who's Who' page within the 'collection features' section of the National Gallery website. On BBC ONE, a major three-part factual drama series unravels the intimate history of The Impressionists. To contemporary eyes, Impressionist paintings possess a simple and familiar beauty: the delicate hues of Monet's water lilies and Degas' exquisite ballerinas. But these paintings caused riots in the art world when they first appeared in Paris at the end of the 19th century. Viciously attacked by critics and rejected by the public, the Impressionist painters were outcasts in the art world. Filmed in France and entirely based on an extensive archive of letters and documentary evidence, The Impressionists tells the intimate history of the brotherhood of Monet, CÃ©zanne, Renoir, Manet and Degas in their own words. The Impressionists Three-part factual drama about the Impressionist painters. Claude Monet remembers his early days in the Bohemian world of 19th century Paris, where he meets his friends and allies Auguste Renoir and Edgar Degas. Rejected by the Paris art world and beset by poverty, they refuse to compromise their bold new approach to painting. When war breaks out with Prussia, tragedy strikes. Rivalries, romance, and a struggle for recognition a unique insight into the world of the Impressionist painters in a fascinating new factual drama for BBC ONE. a brand new National Gallery website page dedicated to the Impressionists that can be seen at the National Gallery. It provides a quick introduction to how the group came about and then individual "who's who" overviews of each of Monet, Degas, Renoir, Manet and Cezanne. 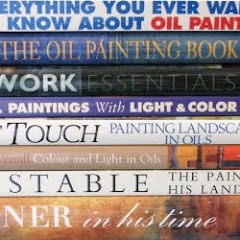 Each of these provides images of sample paintings produced by the artist, plus a summary of their life and work and links to the remainder of paintings held in the National Gallery collection. It's a fairly basic summary but appears to be a long overdue addition to the highlighted collection features section of the National Gallery website. The Impressionism Gallery within the BBC Arts section. The thumbnails enlarge to reasonable sizimageses of the paintings and provide attribution as to artist and date but not location - which I can imagine might infuriate the galleries which have these on exhibition! Interestingly there are no paintings by Monet included in thiextremelyly cursory 'overview'. the recreation of the First Impressionist exhibition in 1874 in Mark Hayden's archive of art history. For those interested in art history, in my opinion, this is the most superior site - providing copies of the actual catalogue, excellent images and extracts from critics' comments on individual paintings are the time. One also gets to see paintings 'hanging' side by side which provides a more complete perspective on what the artist wanted to say at that time. For example, before visiting this site, I'd never seen Monet's painting of "Le Havre" or realised that four of the nine paintings he had in that exhibition were pastels. So......."The Impressionists" - a programme providing an interesting account of a fascinating time in art history or a soap opera? Having now read the synopses of each episode, I can't wait to see! Posted by Making A Mark on Sunday, April 30, 2006 0 comments Who's linking to this post? I was at the hospital on Thursday for an annual check-up and remembered to take my Moleskine with me. These are two quick sketches I did. 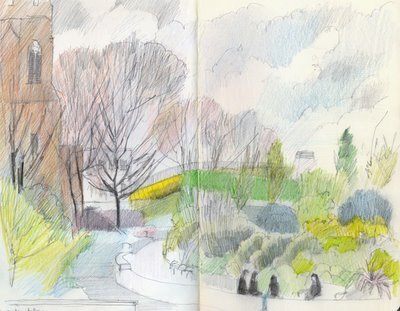 The second one (which took maybe 15 minutes and was then coloured from memory using coloured pencils when I got home) is of one of our local millenium projects - except it's in the background of this sketch. 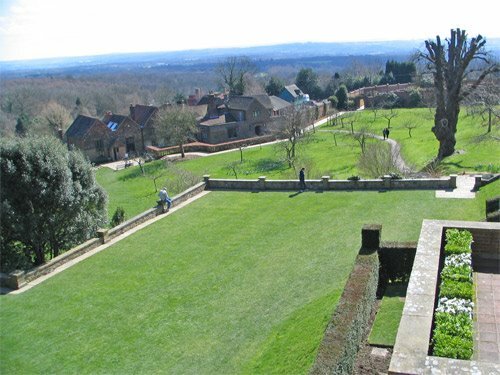 We have a "green bridge" which goes over the main road from Essex and the east of England into the City of London. It connects up two bits of Mile End Park which is a long linear park which runs most of the way from the formal and traditional Victoria Park down alongside the Regents Canal nearly as far as the River Thames. (Mile End Park was the temporary home of Rachel Whiteread's "House" which won the Turner Prize in 1993.......and the Anti-Turner Prize!). Posted by Making A Mark on Saturday, April 29, 2006 1 comments Who's linking to this post? The drawing fills an A2 piece of heavy white cartridge paper and was completed in just over 2 hours using a mechanical pencil. I rather enjoyed the fact that because it's light I can now see the buildings outside the windows and in addition to the grid presented by the windows and wall I've now got a more detailed grid to measure body parts and faces against which is the grid of lines through the window. Posted by Making A Mark on Friday, April 28, 2006 3 comments Who's linking to this post? Marissa Lee Swinghammer's blog - m lee fine art - made it to the Number One spot within the Blogtopsites Art section yesterday. The secret of her success? Her blog featured as Blogger's Featured "Blog of Note" on the Blogger Home Page earlier this week. Marissa is an artist living and working in Boston whose primary love is woodblock printmaking. She has a wonderful sense of line, design and colour and makes stunningly beautiful prints which you can also see on her Flickr site and buy from her Etsy store. I so wish I could have a go at print-making but I've experienced nerve damage to my right hand which makes gripping anything too tightly out of the question. I just admire those that can instead! I've added Marissa's blog into the blogroll in the right hand column. She updates it on a regular basis as she produces new prints and shows you the process she goes through - so if you want to learn more about woodcuts and/or like what you see grab a feed! Posted by Making A Mark on Thursday, April 27, 2006 1 comments Who's linking to this post? I've been a bit busy recently and have been trying to catch up with about a week's worth of posts on the blogs that I regularly read . Which is when I realised that Armand on Moleskinerie posted a week ago(!) to announce that the company which makes Moleskines is to be sold. Read all about it here on Moleskinerie and here. Posted by Making A Mark on Thursday, April 27, 2006 0 comments Who's linking to this post? Since yesterday's post was very focused on travel journals and sketching while travelling, I thought I'd include a sketch I made on one such journey of mine. It was done some years ago but is still very much a favourite of mine and I really wanted to give it an 'outing'. I sat in Ary's Warung on the main street in Ubud in Bali and started to draw some people while I had a pot of their lemon grass and ginger tea. And it just turned into one of those sketches where you order another pot of tea and then lunch as your sketch keeps creeping across the page until every last bit is filled. People came and went - which was a bit of a challenge - and the Japanese couple with their suitcases that I had started sketching originally finally left for the airport to catch their flight. This was completed using a mechanical pencil and is on one of the last pages of my A4 size black Daler Rowney sketchbook as I completely filled the whole sketchbook on a long holiday with family in Australia and painting in Bali. Posted by Making A Mark on Thursday, April 27, 2006 2 comments Who's linking to this post? I'm entranced! I discovered a new site yesterday due to a reference by a member in one of the groups I belong to. And it's wonderful! Strictly speaking it's a website rather than a blog - but it does have very strong journal/e-zine elements to it. 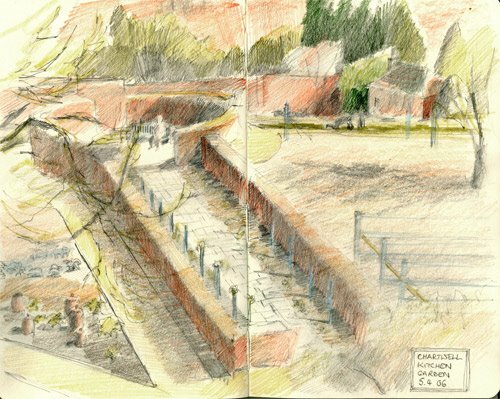 "site is dedicated to the study, appreciation, and promotion of personal sketching to enhance our travel logs, illustrated journals, nature diaries, art projects and more. " It's been developed by Martha McEvoy - who is extremely successful at keeping her name off the website - I only found it when looking at who produced some of the things on the site. I haven't even begun to explore all the links yet but I have had a good look at the two volumes of Trumpetvine Travels - which is an e-zine in pdf format with wonderful articles about travel sketching and more with lots of illustrations. Both volumes are freely available to download - but BEWARE they are both extremely large files and make sure your printer has got lots of paper as both are 40 pages long. 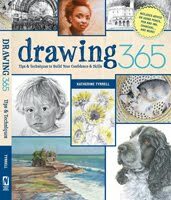 sketchbooking - featuring Barbara Stecher, a Massachusetts artist - her technique "emphasises the process of a keeping sketch journal over the quality any one entry"
All in all 'a jolly good read' - and well worth taking some time over. Posted by Making A Mark on Wednesday, April 26, 2006 3 comments Who's linking to this post? Wednesday 26th April - Ken Kiff and "The Sequence"
Wednesday 10th May - Professor Deanna Petherbridge "The Poetics of Line"
Wednesday 24th May - Ian Kiaer "On Drawing and Model-Making"
Wednesday 14th June - Alison Wright - "On the turning figure in Michaelango"
Posted by Making A Mark on Tuesday, April 25, 2006 3 comments Who's linking to this post? There were lots of e-mails whizzing around the coloured pencil world yesterday as we got the first announcement that Derwent are launching a new range of coloured pencils - Derwent Coloursoft Pencils - in May 2006. There's nothing official as yet on the Derwent company website however an announcement was made by Bob Ebdon, founder of the United Kingdom Coloured Pencil Society, and one of the professional coloured pencil artists involved in both the development of the new pencils and artwork produced using the new pencils which will be featured in its launch. Bob has very helpfully produced images of the colour chart he has made with his sample pack, a photo of what the new pencils look like and their packaging and the artwork he has produced using the new pencils. You can see his announcement and view these images here. Since the demise of the Berol Karisma range of wax-based colour pencils (the European version of the Sanford Prismacolor range) last year (I'm still buying up old stock where I can find it!) and the Stabilo Softcolor range there has been a marked gap in the production of coloured pencils in Europe. Faber Castell Polychromos and Lyra Rembrandt pencils are emphatically oil-based pencils and, along with the Caran D'Ache Pablo range, I like and use them a lot. However, I am beginning to get concerned about my dwindling supplies of Karismas with their buttery soft experience particularly in relation to those colours which I could only find in the Karisma range. Bob praises the performance of the new Derwent Coloursoft range and his colour chart suggests that the colour range looks very promising. I can see evidence of a very good range of greens - including yellow greens - and some of the coloured greys that I use a lot of which are difficult to find in other ranges ('grey lavender', a deeper shade of 'grey green', 'loganberry', 'blackberry'). I'm also very pleased to see the 'blush pink' which appears to be a coral shade of pink which is a colour which is missing right across every range I know of. The 'ginger' shade also looks like it might be a little less 'earth' related than some of the mid brown shades on offer elsewhere. The major omission appears to be breadth in the aqua/turquoise shades - which I also use a lot. But since I frequently mix brands when using coloured pencils I'm less bothered by this as these are very adequately catered for in other ranges. Bob's artwork, produced using a trial set of 24 colours, also indicates that the pencils provide a pigment rich experience and he's very satisfied with the softness of the new pencils. I've never been a big user of Derwent pencils as I personally have always found them too dry and scratchy - and I spoke to one of their representatives at the Artist and Illustrators Exhibition at some length about this problem last year. I haven't been the only one who was less than satisfied with the performance of Derwent pencils and I'm really pleased they've listened to various artists' gripes on this topic and have responded with a new range - which sounds very promising! I'll certainly be giving them a try. Now if we could just get them to make them with a thinner barrel as well so they fit in all the pencils sharpeners we'll be laughing! Posted by Making A Mark on Tuesday, April 25, 2006 5 comments Who's linking to this post? Every year the UK Coloured Pencil Society has two exhibitions - its main competitive one and the "World of Coloured Pencil" exhibition which is currently being held at the Cumberland Pencil Museum, at Keswick in Cumbria. For this exhibition, pictures submitted can be pure coloured pencil, or may use other media as long as coloured pencils are the main medium. It is also NOT a juried exhibition, and pictures are selected on a first-come basis by a specific date. This means that it reflects, much more than the main UKCPS exhibition, the range of abilities within the Society, from beginners to professionals. You can see the work submitted and the work which won prizes here. Alternatively - you've got one more week to see it in person! Details of how to submit to the main UKCPS exhibition - the 5th Annual OPEN International Exhibition - held in September 2006 can be found here. Posted by Making A Mark on Monday, April 24, 2006 0 comments Who's linking to this post? My copy of "The Pastel Journal" arrived this week and besides a riveting read and viewing of the Pastel 100 it contained a very interesting article by Michael Chesley Johnson on "Safe Havens: Artist's Retreats". Besides talking about the value to an artist of a retreat (or painting holiday) or residency program, Michael provides a list of Painting Retreats and Workshops for pastel artists and a reminder about the ones which can be found at the back of each edition of the Pastel Journal. He also highlighted the information about Arts and Crafts workshops which can be found at www.shawguides.com. This is a source of relevant information I'd not come across before - but this is maybe linked to the fact that it mainly covers workshops in the USA or delivered by USA based artists. I wasn't very impressed with their search function which threw up a lot of irrelevant workshops for the search terms I used - but there's certainly a lot of information on the site. This list includes three distinct types of residency programs. Artist in Residence (AIR) programs are hosted by an institution such as a college, national park, or museum. 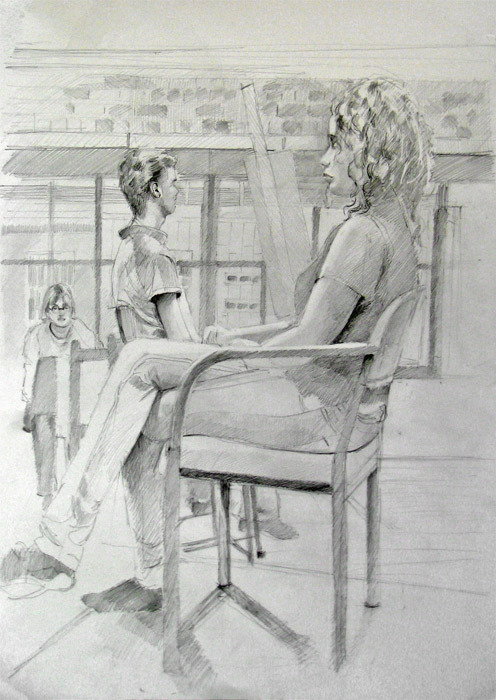 These programs usually run for long periods of time (a year, or a semester), usually host only one artist at a time, often pay an honorarium, and often expect the artist to interact with the public by offering a class, or presenting in some other fashion (which can even include allowing the public to watch you work in your open studio). Artist colonies exist to allow artists time to work without distractions. Most are located in rural areas, and there is no public interaction (most have rules prohibiting anyone from interrupting artists in their studios between 9:00 and 5:00). A few can offer a modest stipend, and some request payment (usually partial payment of actual expenses), but many allow artists simply to come for free. Artist colonies usually have a number of artists in residence at any one time (from 4-20), and a sense of community builds as residents share dinners and breakfasts together. Artist colonies host artists for lengths of time ranging from two weeks to three months, but most last approximately one month. Both AIR Programs and artist colonies request work samples, references, and an essay describing your work plan while in residence, and both are competitive, with panels evaluating applications. A third category of retreat programs are not competitive and require no work samples or elaborate applications. These retreats serve artists on a first-come, first-served basis for a fee. These programs tend to last for shorter amounts of time, such as a week or two. 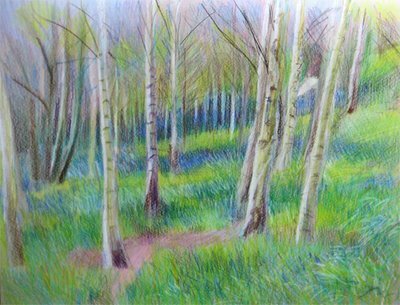 I'm certainly planning to post comments on the pastel workshops I'm taking later this year and it would be good to read about other people's experiences on their blogs. Feel free to comment or post links to similar such posts on other art blogs - while bearing in mind my comments policy and the fact that this is not an invite to those delivering such retreats or workshops to advertise! Posted by Making A Mark on Sunday, April 23, 2006 2 comments Who's linking to this post? ...........to Associate Member status with the Society of Graphic Fine Art. This is the first step towards being able to apply for Full Membership (in 3 years time) with associated signature status. The Society of Graphic Fine Art is a professional society founded with the declared aim of fostering good drawing skills. Membership is open to any artist who works within the criteria of the Society but members are elected solely on the quality of work submitted to the Council. 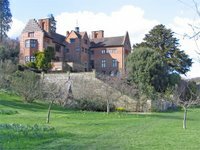 Previous members of the Society have included Sir Frank Brangwyn (an early President), John Piper and Dame Laura Knight. "Graphic" as a term is now commonly used to refer to commercial art, advertising and design. However according to the website, in 1919, when the society started, the term "graphic" was used to mean any artwork, by whatever method, which was mainly linear in content and character. Fine Artwork accepted can be in colour or mononchrome with media ranging from pencil, pen and wash and watercolour drawings to book illustration; engravings; lithography; woodcuts; etchings and silk screen prints. Subjects covered range from still-life to figurative and non-figurative landscapes, abstracts, figure drawings and botanical and animal studies. work excluded from consideration covers oil paintings and layouts or designs for advertisements or packaging. Thus current members work in both traditional and contemporary styles using all drawing and print-making media. The "application for admission as an associate member" process is very simple in process terms but requires the submission of more artwork than a lot of societies which invite applications for membership via acceptance into exhibitions. I had to submit a portfolio of work - four completed pieces in mats and 12 additional drawings or a sketchbook plus a short resume of my art training and career. I then had to turn up yesterday morning to deliver my portfolio at 11.30am for consideration by the Council and then again at 3.00pm to collect it - and hear the result of my application there and then! A very simple, fast and somewhat nerve-wracking process - but with a very pleasing result! Posted by Making A Mark on Sunday, April 23, 2006 3 comments Who's linking to this post? I've been discussing how to 'look' at a potential subject for a painting recently - and in that connection how to crop a subject. All conventional stuff . But how often do we remember to try and get a different perspective on something we're used to looking at? Such as looking "up at it" rather than "at it"? Posted by Making A Mark on Saturday, April 22, 2006 1 comments Who's linking to this post? This is mechanical pencil on a sheet of Arches HP watercolour paper 9 x 12 inches. Posted by Making A Mark on Friday, April 21, 2006 6 comments Who's linking to this post? This is the first of three articles. This article covers tips, information and resources to help you deal with copyright infringement, the theft of your blog or website content. The second article includes helpful links and resources for finding stolen content and copyright infringements. The last article in the series examines the growing trends in content theft such as image hotlinking, website hijacking, and abusive use of feeds to replace original content without permission, as well as other copyright infringements on the rise. Be sure to read the other articles too - I'll be providing a link to them in this weblog. And finally, please note the Creative Commons license relating to her blog! Posted by Making A Mark on Thursday, April 20, 2006 1 comments Who's linking to this post? My copy of the April edition of "The Pastel Journal" arrived all the way from across the big pond yesterday - and gosh is it BIG this month! It's simply bulging with luscious images of the pastel artwork which were distilled down from 4,000 slide entries to the final 100 of the 2005 Pastel 100 competition. You can see a couple of the winning entries on this page of the website including the winner of the Jack Richeson/Best of Show Award - a painting by Paul Murray and Brian Cobble's painting which won the Ruth Richeson/Unison Pastels Award. One of John Vistaunet's female nudes won the Pastel Journal Grand Prize Award. Aaron Schuerr also won the Art Spirit Foundation / Dianne B Bernhard Gold Medal Award of Excellence (there's a lovely photo of Aaron pastel painting plein air - with his very small son Isaac planted between his feet!). Colleen Paul Hoerner won the Silver Medal. the competition is open to all artists except artists who've been honoured with an Art Spirit Foundation award in the last three years in any competition. Artwork which is eligible are original paintings completed using at least 80% soft pastel . 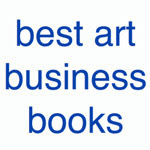 Paintings which are not eligible are those painted using oil pastels, and/or based on published material, and/or completed during a workshop under another artist's supervision and/or those previously published in a national publication or in receipt of a major award in a national competition. There are some additional restrictions of the normal sort associated with competitions. Entry is by 35mm slide. The deadline for entries for the 2006 competition is 1 September 2006 and winning entries will be shown in the April 2007 edition of Pastel Journal! Lots of time to produce a stunning pastel work! Posted by Making A Mark on Thursday, April 20, 2006 0 comments Who's linking to this post? I've updated the resource links in the right hand column to include a number of plein air painting organisations. 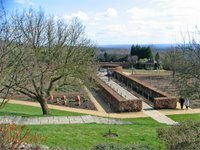 They're listed in the section on Landscape and Plein Air Painting - about half way down. 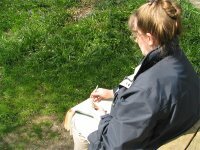 Many of these websites are keeping up to date listings of their current planned plein air expeditions and exhibitions - and a number have lots of good photos of the plein air experience. I confess as I got to each of the websites listed I proceeded to plunder their Links page to generate the next websites to review so I think this might now be a very comprehensive list. It's certainly more comprehensive than any seen on the websites listed. I've included all the ones which appear to be starting out (and are still under construction) but have excluded those which appear to be rather dormant. As before if anybody thinks they know an organisation which should be listed please let me know via a comment. I'd be more than happy to be able to convert the current listing into one tagged North America if I could start listings for the UK and Europe. Why is it that so many art societies in the UK seem to be so dedicated to limiting their activities to having demonstrations or talks with slides or painting a still life indoors or social get togethers rather than arranging plein air events/expeditions? It can't be the weather - as we only need to go and look at some of the photos of the weather some of our north american artist friends paint in! 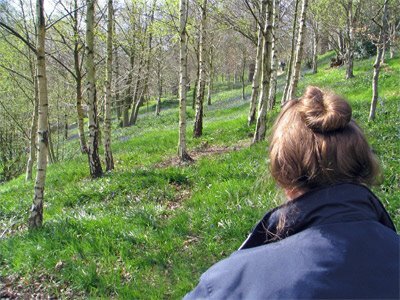 Maybe we need a focus or a network for plein air activity in the UK? It's not as if it isn't happening - it's just not happening on a website near me - whinge now officially over!!! Maybe somebody will prove me wrong...........please? Posted by Making A Mark on Wednesday, April 19, 2006 6 comments Who's linking to this post? 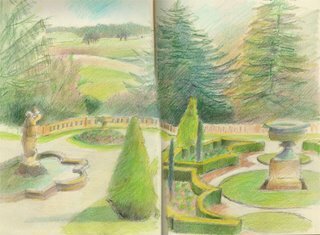 Last Saturday, I sketched at Tatton Park - these are views of the rear of the recently restored Japanese garden and the view of the park from the Italian gardens just in front of the house. Posted by Making A Mark on Tuesday, April 18, 2006 3 comments Who's linking to this post? It amazes me that there aren't more blogs which focus on plein air painting. I would have thought they'd be an ideal way of communicating both planned expeditions for groups and recent results of both group and individual outings to paint "en plein air". Maybe the plein air painters have been too busy painting to blog - however I think numbers are now beginning to grow! "Plein Air Painting" is a term derived from French and is frequently used to describe painting from life in the open air and out of doors and away from the studio. 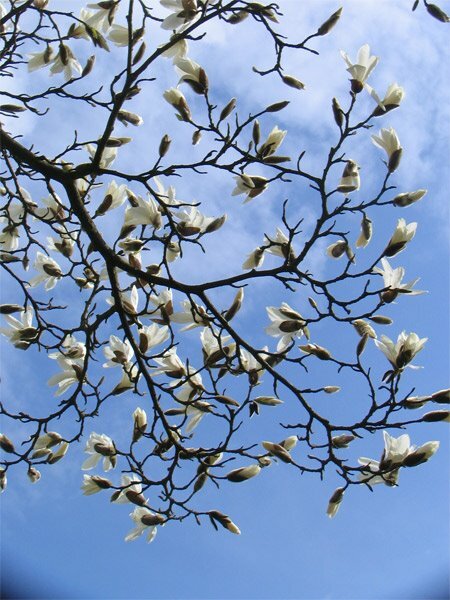 It's also sometimes used as a euphemism for painting nature and the natural world. There's a good description of plein air painting and how it came about on the website of the Plein Air Painters of America. There is a further succinct glossary entry defining "plein air" on the Tate Gallery's website. "Plein Air Painters of Chicago"
weblogs like this one - which I wouldn't consider to be primarily about plein air painting, despite the fact I post plein air work, as I post about a lot of other things as well. So if anybody reading this comes across any blogs primarily about plein air painting - please do let me know! Posted by Making A Mark on Tuesday, April 18, 2006 2 comments Who's linking to this post? One of Claude Monet's outstanding achievements was the design and construction of the gardens at his home at Giverny - which then provided subjects for many of his more famous paintings. I did this pastel painting of the Grande Allée at Giverny a while back. The nasturtiums cover the path and gradually make their way across the path over the course of the summer. I did a smaller colour study before tackling this larger one - which now hangs on the wall of the guest bedroom in my mother's home. I managed to get a photograph of it last week while visiting. It's a great painting to stare at when waking up or dozing off! Claud Monet's house and garden - main website for Giverny and a source of a lot of information about the garden. plan of the gardens at Giverny - the Grande Allée is in the centre of the top garden which is next to the house - the plan shows the arches over which plants climb. 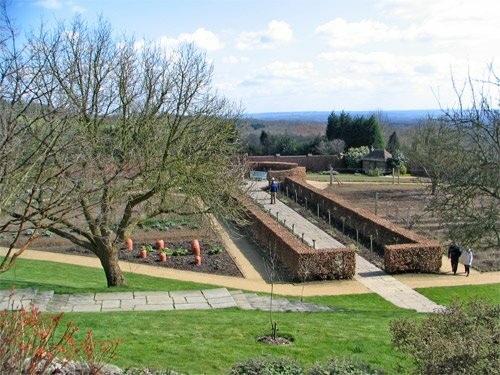 The garden at the bottom is the one around the pond which is home to his waterlilies. 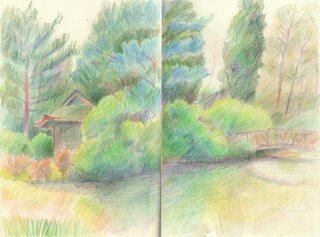 how to paint at Giverny - painting while people are visiting the garden is difficult but not impossible however permission can be sought to visit the garden on a Monday when the garden is not open to the public. Posted by Making A Mark on Monday, April 17, 2006 2 comments Who's linking to this post? 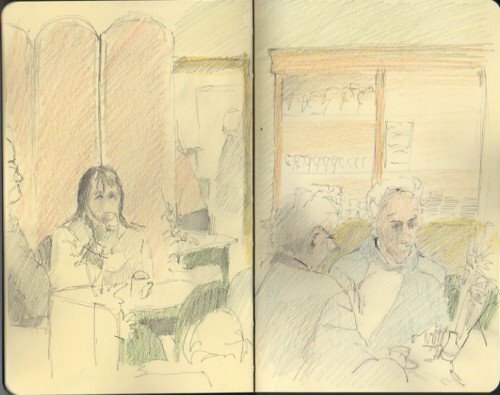 I did this very fast sketch yesterday of people in the tearoom at Biddulph Grange Gardens - a National Trust property in the north west of England. Mother and I visited yesterday, very dull day and the cold weather has held back a lot of the growth but it was great for seeing lots of hellebores and the first shoots of the giant asiatic lillies which they grow there. Mother was very pleased as she got some seeds of the latter! Posted by Making A Mark on Thursday, April 13, 2006 3 comments Who's linking to this post? I'm pleased to announce that I'm the featured artist on Moleskinerie this weekend. (Thanks Armand!) - if anybody is reading this after this weekend the link is here. Two of my favourite occupations - eating in restaurants and sketching - which includes one of the sketches in the Moleskinerie entry. And there will be another one today if I ever work out how my mother's scanner works! 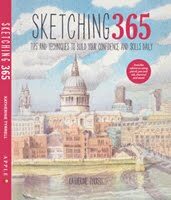 And for all those who want to do watercolours in their Moleskines - but have been disappointed by how the surface of the paper sketchbook responds - I note that at the end of this month the new landscape format Moleskine designed for watercolour is being published - more details here. Posted by Making A Mark on Wednesday, April 12, 2006 3 comments Who's linking to this post? I'm away from my normal computer at the moment and have just been through that cookie moment again! You know the one "your normal cookie functionality has been disabled". Guess that chat with mother about the 'belt and braces' approach to computer security worked! I just had to try and remember what to do next! In the meantime, here's one I wrote before I left. Posted by Making A Mark on Wednesday, April 12, 2006 0 comments Who's linking to this post? My personal position is I very much enjoy working from life - but a photo can also be just one of the tools I will use to create a painting I have in mind. However, I do think that it's best not to use photos in this way unless you have also worked from life as otherwise it's difficult to know the differences between the drawings you make and the photos you take from the same spot. 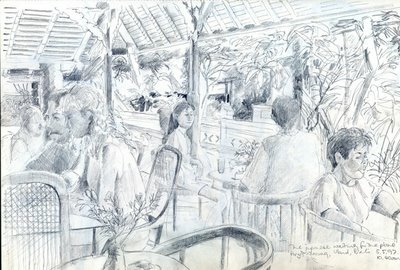 Once you've studied an object or place (through drawing) so you have a strong mental image and then produced a drawing as well as taken photographs and then seen the significance of the differences between these different images nobody would ever rely on photos again for the 'truth' of a place or a person. Photos rarely represent tonal values accurately and quite often get colours wrong. What they are great for is reminding you about place and the details of the bits which didn't work quite so well in one's drawing. Working from a photo is also a great way of learning how something works (eg how do all the bits fit together) before you try drawing it from life for the first time. I think that's why, in the past, art students used to draw the statues before they were let loose on live models! Digital images (from cameras) are very helpful if you want to try doing a painting with a particular colour theme. I try manipulating photos I've taken on a computer using photoshop before trying to produce a painting in real life - it saves wasting art supplies - and also leads to being more adventurous, for example, in the use of colour once I've seen some of the possibilities of what something could look like. Photography is also an excellent way of practising one's compositional skills. I frequently take photos in order to try out different perspectives on an object. It's not about using a photo to create the object so much as using the camera and the viewfinder to look at what potential exists to create a piece of artwork from that particular scene or object. The photo then becomes a record of that thought. But I do think that the artwork of those who work from photos all the time can start to look very sterile after a bit. It's the lack of imperfection which I don't like. Posted by Making A Mark on Monday, April 10, 2006 5 comments Who's linking to this post? 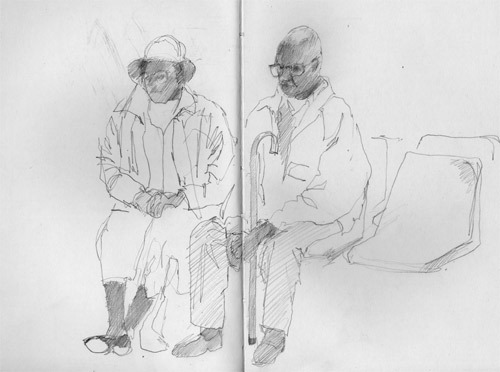 Moleskines are a great size for when you're trying to draw people on the tube. I travelled to see my god-daughter yesterday (I'm doing her portrait for her 21st birthday present - and we were having our first artist/client consultation!) and used the tube to get across town to Hammersmith. Having gone all kitted out with arty stuff I thought I'd limber up by trying to draw the other people on the tube. Now anybody who knows the underground in London will know that smooth running is NOT what it excels at - and trying to draw while the compartment bounced around on the rails was interesting to say the least! The worst problems associated with drawing on the tube are not knowing which stop people are getting off at (rule of thumb - it's always just before you get to the important finishing bit you've been putting off) and the vertical poles which people hang on to tending to block out out key bits of people's faces. I tried to draw two women - each time the pole cut the face in two! On the other hand you do get the dozing traveller - who is unlikely to move their head very much. 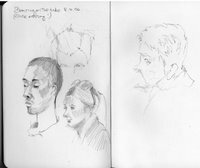 So - these are not examples of great drawings but rather evidence that it is worth taking the Moleskine when using the tube! Posted by Making A Mark on Sunday, April 09, 2006 4 comments Who's linking to this post? I visited the Society of Botanical Artists exhibition yesterday and was totally blown away by the very fine quality of most of the artwork shown. There are some very impressive and accomplished artists exhibiting with the SBA - including a number of coloured pencil artists. Most of the artwork is in watercolour with a good showing of coloured pencil and pencil work, although the exhibition also includes work by people painting in oils and pastels. The website while clearly demonstrating the breadth of work fails to reflect so clearly the very high quality of a lot of the work on display due to the small size of the website images. There is a tendency at times to assume the terms 'botanical art' and floral art' are interchangeable whereas the former includes studies of fruit, vegetables, fungi and all other things botanical. I particularly enjoyed the number of fine drawings and paintings which involved various fruit and vegetables. 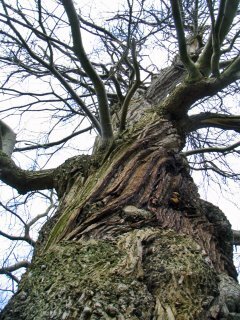 As Charley Parker commented in his blog 'Lines and Colors' yesterday , roots also make the most fascinating subjects for drawings - and the mandrake root executed by Yvonne Edwards was no exception. The President's Award went to a very fine pencil drawing of a female arauccaria araucana - which is better know to most of us as a "monkey puzzle". It was a pleasure to meet Ann Swan who was demonstrating yesterday and to see her coloured pencil and graphite work in person. I was also very taken with the coloured pencil work of Susan Christopher-Coulson. Her prize-winning "Autumn Harvest with medlar" was particularly impressive. Susan's work can be seen on her website www.floraleyes.co.uk Susan Martin's coloured pencil art is large, colourful and had an extremely high quality of finish . Her Vreisea splendens (a bromeliad with the common name of "Flaming Sword") also won a prize. 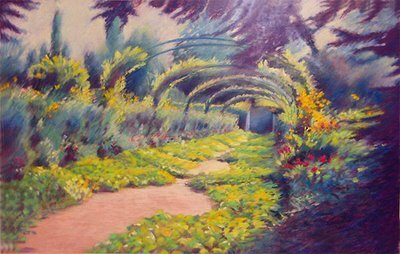 Eiko Yoshimoto's very impressionistic pastel painting of the Isabella Plantation at Richmond Park pushed the boundaries of the sort of floral painting people might normally associate with botanical art. Other pastel artists included Maureen Jordan and Linda Patterson. From a personal perspective, I also very much enjoyed chats with fellow artists about the various practical issues that we all have to deal with - not all of which were directly related to the application of pigment to paper! And for all those who agonise over exhibitions and matting and framing (you know who you are!) I saw some extremely good quality displays yesterday and I'm now totally won over to double matting - in fact I'm off to get some cut this afternoon! Posted by Making A Mark on Friday, April 07, 2006 0 comments Who's linking to this post? I'm not a great user of watercolour pencils but have a go with my set of Van Goghs every so often. I'm always on the look-out for useful tips for how to use them as I know some people who excel at creative and attractive mark-making involving the use of watercolour pencils! 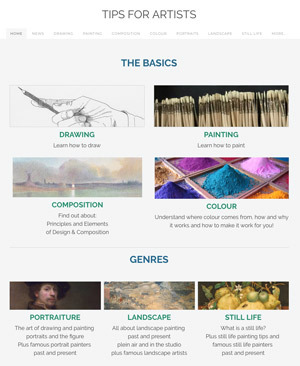 This week I came across a couple of good summaries about them in the painting.about.com library which will be particularly helpful to those who would like to try them. I'd been visiting the painting.about.com website as I'd begun to notice an increase this week in the number of people visiting my weblog from that site - and now I know why! Many thanks to Marion et al for highlighting this weblog in the 'related blogs' section! Posted by Making A Mark on Thursday, April 06, 2006 0 comments Who's linking to this post? Posted by Making A Mark on Thursday, April 06, 2006 8 comments Who's linking to this post? I've found in the past that it's always educational to attempt to draw a moving subject which has a routine or a limited range of movements. It's a useful exercise to follow, as a step up from life class, when trying to learn how to draw a live and moving object with no routine. My typical subjects in the past have been people eating in cafes or restaurants and other artists. The process of attempting such drawings also seems to make the challenges of a life drawing class rather less daunting - at least there the model tends to sit still! However I've never ever tried to draw a live bird before. I heard about the web cam which is watching a mummy eagle sitting on her brood (she seems to have two eggs). I wondered what sort of drawing might be possible in a short space of time. So I set a challenge for some friends of mine and myself to click the link - with pen/pencil and paper in hand and then sketch for 10 minutes. The results have been very interesting - and accomplished - and the consensus seemed to be that the exercise was a real confidence booster in relation to drawing in this way again! What were the problems? Well the main problem is that she's very interested in her surroundings - see for your self! http://www.infotecbusinesssystems.com/wildlife/ The other problem is that there are some problems with page loading presumably because the site is getting a tremendous number of hits - once the sponsor advert starts rolling and the man starts talking just hang on - Mummy eagle is just behind. And the final problem is you keep wanting to watch the eagle - very distracting! 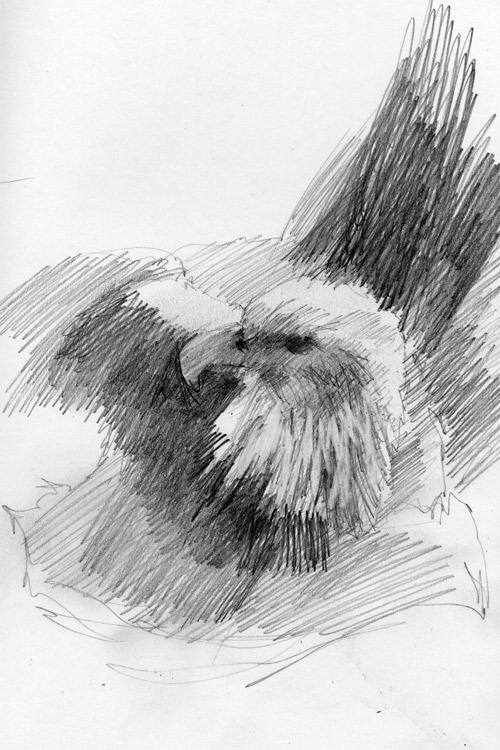 Here's my two 10 minutes sketches of an eagle who constantly turns her head and periodically gets up and inspects her nest and her eggs. I was only intending to do one but she turned around! Have a go at drawing her and see what you learn! Posted by Making A Mark on Wednesday, April 05, 2006 2 comments Who's linking to this post? 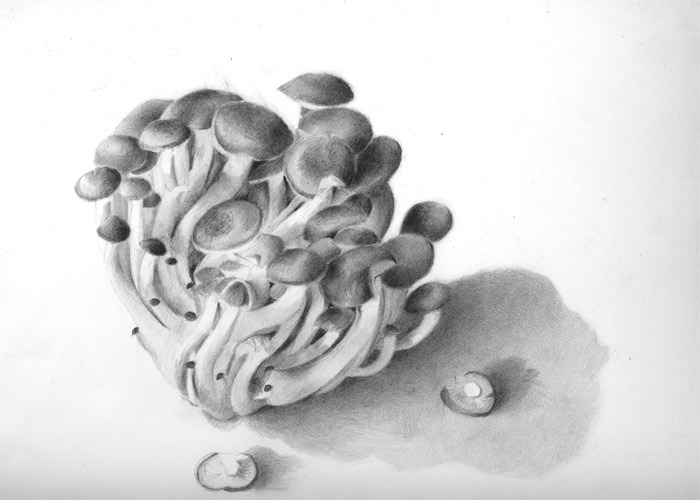 There are quite a few websites around with communities who are helpful to people learning to draw and sketch. This post contains a couple of such website communities for people starting out. An ongoing discussion about creativity, drawing, journal making and seeing more clearly. This group grew out of Danny Gregory's weblog, Everyday Matters and his book, The Creative License. We have a weekly drawing challenge and also a secondary gallery site here and a Flickr group and a Frappr map site that records members' locations for get-togethers. too. And NEW! our pbwiki site for further sharing, discussing and what-have-you. 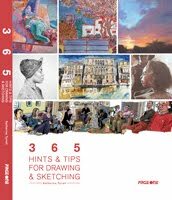 It's big (over a 1,500 members) and has been characterised as being a friendly, welcoming broad-based group for people of all skill levels who are interested in drawing and illustrated journals. In keeping with Danny Gregory's philosophy, the focus there is mainly on drawing for its own sake and as a meditation on one's life, rather than as an activity with other goals in mind. I know that on my travels around art blogs I see lots and lots of blogs which participate in the EDM weekly drawing challenge. 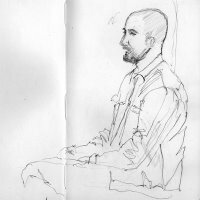 And for those people who are worried about going sketching in public for the first time why not take a look at the EDM sketchcrawl activities? Wet Canvas is an extremely large website with a huge number of different forums. It boasts as at today's date more than 78 thousand members but the number who are active posters is much lower than this. This gives individual forums a feeling more akin to some of other websites for groups of artists or would-be artists where people have a chance to get to know one another. The Drawing and Sketching Forum is one such forum where people are generally very supportive of the efforts of new members. The incomparable 'JayD' (I'm a big fan!) 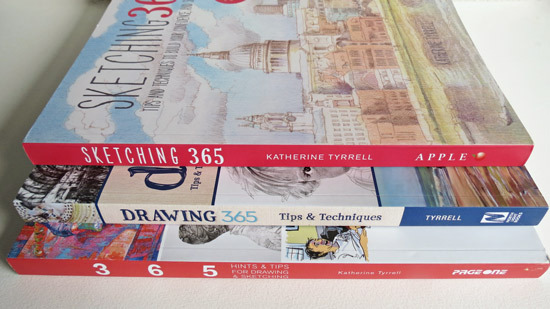 started a self-help approach to learning how to draw back in October 2004 - with "Drawing 101: Class 1 - Drawing Basics" and has developed it from there latterly with the assistance of some guest tutors up to Class 34. They've just started Basic 102 - and have got a class going on at the moment on Intermediate Perspective. All classes are based in "The Classroom" a sub-forum of the main forum. I personally know a lot of people who have gained the most enormous amount from the classes and whose work has improved in leaps and bounds as a result! Posted by Making A Mark on Wednesday, April 05, 2006 5 comments Who's linking to this post? I'm aware that there are quite a few people who want to learn how to draw better or how to sketch in public so I'm going to do a few posts on a "Learning to Draw and Sketch" theme where I'll highlight some of the sites which people might find useful. I'm going to put this post in the Drawing Resources section and will then update it with links to other threads as these get written. 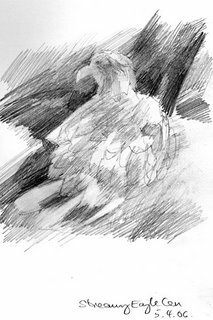 It will then provide a structured index to all that is written on this blog about learning to sketch and draw. Posted by Making A Mark on Wednesday, April 05, 2006 1 comments Who's linking to this post? I've got more links to botanical websites to go in the right hand column. I've always felt drawn to botanical art but have never been quite sure that I've got the patience for the very detailed work and control required for drawing and painting flowers within the context of botanical art. I'm also on a really big flower "binge" at the moment - maybe it's all that colour that I need after what has been a very long and grey winter. Anyway, I'm running out of large vases! 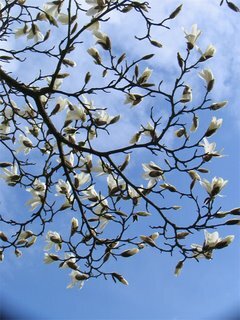 We had a warmer day with blue skies at the weekend and yesterday I noticed that suddenly everything is beginning to burst into bloom! Both of the national societies are very similar to the UK one - providing membership information, galleries of art by members, information about exhibitions and workshops and links to relevant organisations. Both societies also produce newsletters - but you can download the one from the american site - it's excellent and informative and I should think all those interested in botanical art will definitely want to take a look at it. 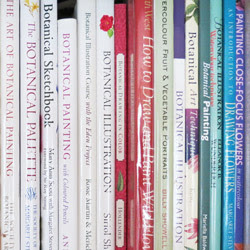 A new initiative within the botanical art world (at least one I've not seen before!) 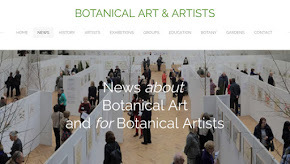 seems to be the development of websites by groups which provide a place to display art by more than one artist outside a botanical society framework and, at the same time, provide links to organisations of relevance to botanical artists. All of the above websites provide an insight into the nature of botanical art and display art by a number of very gifted people. The reason for singling Ann Swan out - besides the fact she's a UK artist - is that Ann works in coloured pencil producing contemporary botanical art. Her sites demonstrates what can be accomplished with coloured pencil - and the oil paint depth of colour that can be achieved if you have the patience and the talent. Ann's site also usefully reproduces two articles which provide an insight to how she works. I've provided links to each of the above in the flower section of the right hand column - it's about half way down - keep scrolling! Finally - do please take a look at the gallery of flower drawings produced by Laura (of Lauralines) in 2005 which you can see on her blog. This is not botanical art per se - being more sketchy drawings and paintings produced in a much looser way but they are lovely and colourful and equally impressive. Posted by Making A Mark on Tuesday, April 04, 2006 2 comments Who's linking to this post? I made the front cover of FMP!